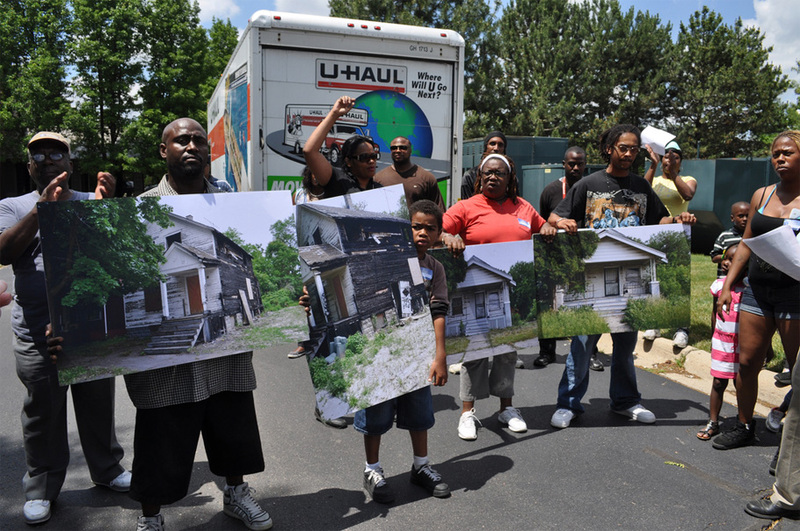 DETROIT – Citizens today cleaned up the land around one of many vacant Detroit properties owned by Ambassador Bridge owner Manuel “Matty” Moroun — then attempted to drop the garbage from that and five of his other properties off at his office. But security for the building, as well as officers from the Warren Police Department, stood guard to prevent the garbage from being delivered. Thanks to the hard work of volunteers who have cut grass, cleared brush and picked up litter — and no thanks to Moroun — six of Moroun’s more than 400 vacant properties have been cleaned up recently, with more to come in the days and weeks ahead. The trash hauled Friday from those sites was enough to fill a 24-foot U-HAUL truck. A makeshift “Matty” was presented with a bill for the clean-up services, along with job applications to show that the trash removal could have provided work for Detroiters. Today’s cleanup took place at 8172 Kenney St. in Detroit. The Kenney site and other Moroun vacant properties are featured on “Matty Moroun’s Parade of Slums,” which can be found at www.mattymoroun.com. A Moroun spokesman told the Detroit News in an article published today that Moroun’s real estate holdings company has begun an “aggressive and specific initiative” to deal with the slums, including hiring people to inspect the residential properties.